This photo was taken in 1991 but I don't need to tell you that because just look at that hideous couch. This essay appeared in the August/September 2016 issue of cầuVNbridge magazine. Click here to read in Vietnamese. 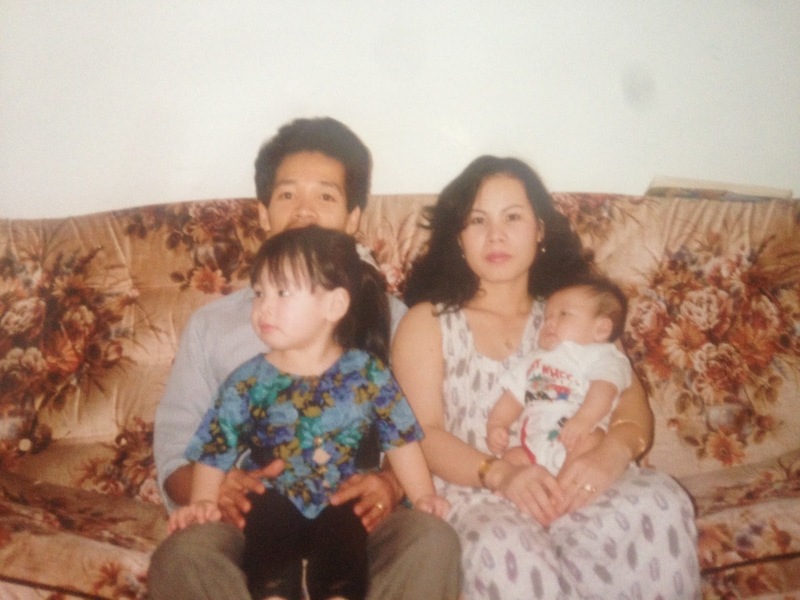 I am the prototype: a second-generation kid who resents the rules imposed by her immigrant parents, who can’t speak her mother tongue without faltering, who connects more with her Canadian values than Vietnamese. I am also a literal child, which means I was born to push my parents’ limits and disagree with them on almost everything. I’ve disagreed with my parents on matters having to do with our different values. In most recent years, it’s been on my drinking even the littlest bit of champagne at a wedding; on moving to Toronto at 17 to chase after a highly unsecure journalism career; on travelling by myself to Southeast Asia just for fun; on dating boys that weren’t Vietnamese nor (gasp!) even Asian. One of the biggest disagreements we’ve had was on the topic of girls and women. My mother’s thinking is firmly rooted in tradition, which means she believes women are best when they’re wives and mothers and cooks. And even though she has built an impressive career as an entrepreneurial nail technician with my father, and handles most of the family finances, she still sets an importance on wife-mother-cook. I never did. Despite all this, I want to believe that I've given my parents many reasons to think I can be the good adult they want me to be. I don't ignore their calls or miss one single Christmas. I got good grades in school and put a lot of energy into my career. Most important, I love them. But I also feel an existential angst over a duty to marry the two cultures and countries. The problem is I don’t know how to do it without compromising who I am or losing a part of my heritage culture. But sometime while I was growing up, I realized that trying to strike a balance is a mirage that only makes children of immigrants feel pointlessly guilty and stressed out. In the dialogue of modern times, the question seems to be how do second-and-so-on generations connect to their Canadian identity as well as their heritage? It’s like the maddening “work-life balance” concept that almost always leaves you feeling like you’ve failed in one area of your life—that you’re somehow less Vietnamese if you can’t speak the language or less Canadian if that was all you spoke all the time. When I was a teenager, I compartmentalized the two worlds; I kept my Vietnamese life separate from my Canadian life (that meant not packing beef skewers in the lunchbox, or inviting friends to the community Tet parties). It was stressful trying to live two different lives when they were both equally important parts of my one life. But back then, it just seemed easier to do that than blend all my cultural commitments into a single, boundary-free life. Separating the two lives made me feel even more lost. It made the cultural clashes I faced with my parents seem like a war of the worlds when really, it was a tremendously un-unique experience. Any child of immigrant parents will tell you their values and their parents’ values line up as nicely as a drunken conga line. Given the way our parents have grown up, a world of a difference from our own, clashes are totally the norm. My mom, who is fifty-something years old, grew up in the fishing village of An Bang on the east coast of Vietnam, just outside of Hue. When she was a kid, she would spend all her mornings in the market to pick up fragrant herbs and fresh fish for the family. She would pop a squat in the kitchen and cook something for the family, like beef congee with fried dough or sweet corn pudding (my grandpa’s favourite). When she grew up and migrated across the world, she also brought her habits and became the sort of woman who can never sit to eat dinner with her family because she is too busy feeding them. I can’t always be challenging her on her traditional ways of being and thinking. It’s in her genetic makeup. And I realize now, as perverse as it sounds, clashing is how we bond. Our east-versus-west arguments give her a chance to slow me down when I’m adapting too fast and too far away from our culture. And it gives me a chance to teach her about the things that are important to me, be it my independence or my freedom. Everyone’s idea of how to positively balance two cultures is different. For me, I stopped shooting for cultural balance and instead worked on strengthening my relationship with my parents. They are my connection to my heritage, not my linguistic aptitude, or my ability to cook a native dish, or even my incredible tolerance for their bitter melon soup. Besides, I can’t think of any better thing that perfectly defines a second-generation kid’s relationship to their parents than a manic episode of culture clash.